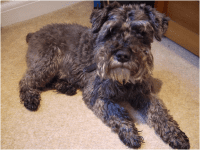 Raffles, our minature schnauzer, dog has enjoyed his walks with Pet Relief for nine years.We have always found Pet Relief to be reliable and very good at understanding the needs and peculiarities of their four-legged clients. Although we no longer require the services of Pet Relief on a daily basis, they are more than willing to walk Raffles on an occasional basis. We are pleased to know we can rely on them to help us out. We have no hesitation in recommending Pet Relief.